View from the CactusPatch: DEREGULATION DID NOT CAUSE THIS PROBLEM! DEREGULATION DID NOT CAUSE THIS PROBLEM! "Subject: FW: How did this mess happen? It moves really fast, but very interesting! Be ready to hit pause because this goes fast….but it shows the REAL cause of the housing crisis and WHO caused it. Please forward this to as many people as you can. PLEASE watch this video – I believe the basic facts are true and correct and , unfortunately , the people getting blamed for this economic mess are not doing an effective job of answering the baseless claims against them. Click the title at the top to watch the video or copy and paste. I believe all of you will vote thoughtfully and I appreciate that – whomever you vote for – but, before you make your final decision – please consider some of the facts put forth in this video!" This has nothing to do with the political message. I cannot vote so I don't pay attention to national politics. I am an English teacher in a high school on the island of Guam. I want to teach my kids the poem Huswifery by Edward Taylor, the Puritan poet. In the poem he uses the common household tasks of spinning and weaving to show how he wants God to use him. The kids of Guam have no concept of spinning or weaving. 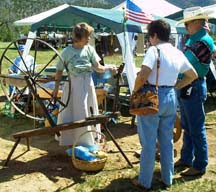 They don't know what a spinning wheel looks like or how a person works with one. Neither do they know what a loom looks like or how a person makes cloth. I am looking for digital video I can incorporate into a lesson using PowerPoint. Does anyone have a source? I have been wearing out Google looking for something and the only thing available is on YouTube and I don't know how to download those.